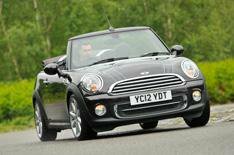 2012 Mini Highgate Convertible review | What Car? The Mini Highgate is the latest in a long line of special-edition Minis named after in-vogue areas of London. Introduced alongside the Baker Street and Bayswater models, the Mini Cooper Convertible-based Highgate is offered in four forms: standard 120bhp Cooper and turbocharged 181bhp Cooper S, as well as 110bhp Cooper D and 141bhp Cooper SD. We drove the 120bhp Cooper model, which costs 21,305, 4005 more than the standard Cooper Convertible. The extra 4k gets you Iced Chocolate paintwork, Truffle bonnet stripes with blue edging, and bespoke 17-inch alloy wheels inspired by the Union Flag. Additional kit over the standard car includes climate control, USB and Bluetooth phone connectivity, a multi-function steering wheel and multi-coloured interior lighting all of which is also available with the 2055 Chili Pack. Whats the 2012 Mini Highgate like to drive? The 1.6-litre engine is unchanged from the donor car, so it delivers lively performance when you work it, and is reasonably flexible. The six-speed manual gearbox is extremely slick, while the steering delivers excellent feedback through corners, yet is light enough to ensure urban driving never becomes a chore. As with most drop-tops, the loss of a fixed roof means bumps send shudders through the cars body, while the Minis firm suspension can make life a bit uncomfortable on poorly surfaced roads. However, the car feels agile and composed, so its great fun on twisty routes. Wind and road noise enter the cabin at higher speeds, even when the roof is up. Drop it down, and life becomes gusty unless the optional 185 wind deflector is fitted over the rear seats. Whats the 2012 Mini Highgate like inside? Pretty special. The Highgate comes with unique Dark Truffle leather seats with blue piping, brushed aluminium trim and leather inserts. Its easy to find a comfortable driving position, too, because the pedals are well positioned and theres plenty of seat- and steering wheel adjustment. However, reversing can be tricky with the roof up because large rear-quarter pillars obstruct your view. With the roof in place, occupants have a surprising amount of headroom, but rear legroom is restricted and you wont get much luggage in the boot. The Highgate is ideal for anybody tempted by the individuality of a special edition, but at 4005 more than a standard Cooper Convertible, that exclusivity is not cheap. Wed save some cash and add a Chili Pack to the standard car instead.